Sotheby’s is looking to present a special selling exhibition, Footsteps of the Buddha: Masterworks from Across the Buddhist World, tracing the historical development of Buddhist art as it traveled and transformed throughout Asia from the 2nd century through the 18th century. This curated multimedia exhibition features an intimate selection of the finest pan-Asian Buddhist painting and sculpture from the ancient region of Gandhara, Nepal, Tibet, China, Japan and Korea, as well as contemporary works of art by Tibetan artist Gonkar Gyatso and Chinese artist Cai Xiaosong. On exhibition from 3 – 23 September 2013, Footsteps of the Buddha will coincide with the auctions, exhibitions and special events of Asia Week in September. To learn more, please visit the Indian, Himalayan & Southeast Asian Art and Chinese Ceramics & Works of Art department pages. This September, Sotheby’s auction of Modern and Contemporary South Asian Art will feature a selection of significant works by Indian, Pakistani and Sri Lankan artists such as Bikash Bhattacharjee, Lalu Prasad Shaw, George Keyt, Rashid Rana and Zarina Hashmi. Highlights include works by India’s Progressive artists such as Maqbool Fida Husain, Ram Kumar, Krishnaji Howlaji Ara and Mohan Samant. PALMETTO, Fla. – Only rarely does a collection come to the auction marketplace that can match for quality and provenance the one Manatee Galleries is offering on July 27th. The Ambassador Ragnar Petri and Mrs. Ingrid Burdin Petri collection of European and Asian fine and decorative art is a testament to the connoisseurship of two world travelers driven by a passion for beauty and cultural history. 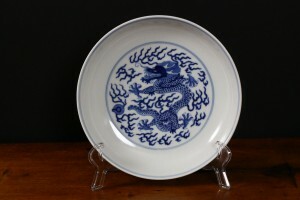 Chinese Guangxu blue and white dish, 7¼in dia., with underglaze blue six-character mark and of the period (1875-1908), featuring curled dragon and flaming pearl amongst thunderbolts. Est. $2,000-$3,000. Manatee Galleries image. Over a period of 65 years, the Petris have formed an exceptional collection that blends the Gylfe Burdin collection with antiques judiciously purchased during their years of diplomatic travels. The collection has remained solely in the Petris’ hands, and they have never before offered it for sale. Everything in the July 27 auction is fresh to the market, and most of the Chinese pieces – which have provenance from the Burdin collection – have been kept within the same family by direct descent for over a century. Manatee Galleries has opted to place conservative estimates on all pieces. The Petris’ favorite Chinese work is a rare Chongzheng (1628-1643) transitional “Wucai boys” covered jar. The 11½-inch vessel is richly painted with a depiction of genteel ladies seated in a garden, watching boisterous young boys at play. 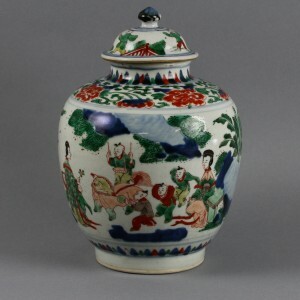 A similar jar sold for HK$275,000 at Christie’s May 2012 sale in Hong Kong. It is entered in Manatee’s sale with a $3,000-$5,000 estimate. An important famille verte covered jar, 18th/19th century, has a Chinese signature on the side of the jar and an underglaze blue double-circle mark, possibly of the Kangxi Period 1662-1722). Its motif depicts a robed dignitary holding a bolt of silk, followed by a servant with a large hand fan. Standing 8 inches tall, it is expected to make $1,000-$5,000. Chinese Chongzheng (1628-1643) transitional “Wucai boys” covered jar, 11½in, similar to an example that sold for HK$275,000 at Christie’s May 2012 sale in Hong Kong. Est. $3,000-$5,000. Manatee Galleries image. Another famille verte highlight is the brightly enameled 17th-century Kangxi Period Chinese plate, 9¼ inches (dia. ), with an image of two elegant ladies in a verdant pavilion garden. The wonderfully decorative border features four cartouches with colorful winged insects. A similar example sold for $17,276 at Christie’s South Kensington’s Sept. 19, 2012 Interiors sale. The plate from the Petri collection carries a $2,000-$5,000 estimate. Manatee Galleries’ catalog describes a rare and important 17th-century Chinese verte covered box as having “the finest-quality painting [we] have seen on a piece that is well over 300 years old.” Its lid is vibrantly filled with the image of two boys – possibly twins – bound together at the waist but running in opposite directions. The 4.1-inch diameter box retains a 1950s label from the Amsterdam gallery “Kunstzalen A. Vecht” and is estimated at $3,000-$5,000. An eye-filling early 17th-century Ming Zhangzhou (Swatow) polychrome basin has steep flaring sides and is generously decorated in iron-red, green, turquoise and black enamels. Its central image is of a bird in full flight amongst peony blooms, and the medallions at each quarter turn bear Chinese marks. On verso, there are old collectors’ labels and a six-character Chinese mark. With no chips, cracks or repairs, the 15½in-diameter basin is entered in the sale with a $1,000-$5,000 estimate. Yet another premier lot is a Chinese Guangxu blue and white dish with underglaze blue six-character mark, and of the period 1875-1908, featuring a central motif of a curled dragon and flaming pearl amongst thunderbolts. The 7¼-inch dish is estimated at $2,000-$3,000. A showcase for Chinese artistry at its most appealing, an antique huanghuali wood screen is embellished with jade and hardstone on its panels, each with a lively scene of activities within an imperial or noble court. The multicolored screen measures 72 inches by 72 inches and is estimated at $4,000-$5,000. Of the Asian scrolls to be auctioned, the most significant is a signed Kanou Motonobu (Japanese, 1476-1559) metallic scroll painting that measures 49 inches long by 19½ inches wide. Centered with an ethereal depiction of three horses standing in water – one of them leaning down to drink – the painting is of particular importance because it was created by the eldest son of Kano Motonobu, founder of the famous Japanese school of painting. The Motonobu Kanou scroll painting exhibits a technique known as wa-kan, a hybrid of Japanese and Chinese painting that requires careful brushwork techniques. The scroll is estimated at $3,000-$5,000. The Petri collection also includes an outstanding selection of English Staffordshire, silhouettes and miniature paintings; and even some mid-century modern design. The star of the European antiques section, however, is a 19th-century “blue john,” white marble and slate urn on pedestal that has been electrified to function as a lamp. Blue john, which was discovered by the Ancient Romans nearly 2,000 years ago, is a rare natural variety of calcium fluorite known as “radix amethysti” for its distinctively colored deep purple veins. The only known deposit of this unusual mineral – also known as Derbyshire spar – was found in the hills of Derbyshire’s Hope Valley in England. Highly prized blue john was a favorite mineral of Birmingham silversmith and ormolu manufacturer Matthew Boulton, who used it in the production of candelabra, urns, candlesticks and other decorative and functional pieces. The blue john mines and seams are now largely exhausted, making the urn/lamp in the Petri collection all the more valuable. Its auction estimate is $3,000-$5,000. Manatee Galleries’ auction of the Ambassador Ragnar Petri and Mrs. Ingrid Burdin Petri collection will take place on July 27, 2013, starting at 4 p.m. Eastern time. Preview July 24-26 from 11 a.m. to 5 p.m., on July 27 (auction day) from 11 a.m. to 4 p.m., or by appointment. The gallery is located at 1007 10th Avenue West in Palmetto, Florida 34221. All forms of bidding will be available, including absentee, phone and live via the Internet through LiveAuctioneers.com, Artfact.com and the-saleroom.com. The online catalog may be viewed online at any of these three websites. For additional information on any item in the auction, to leave an absentee bid or to book a phone line, call 941-722-4800 or email info@manateegalleries.com. Visit Manatee Galleries online at www.manateegalleries.com. BEVERLY HILLS, Calif. – Records were shattered on March 17th at I.M. Chait’s Beverly Hills gallery as the family-owned company known for its expertise in Asian art auctioned the most expensive antique and achieved the highest gross in its 44-year history. The sale of Chinese ceramics and Asian works of art exceeded $3.4 million and was led by a highly important 14th-century Yuan Dynasty porcelain jar that sold for a breathtaking $1,342,000 (inclusive of 22% buyer’s premium). A prominent American collector placed the winning bid over the phone. Magnificent and highly important 14th-century Yuan Dynasty blue and white ovoid porcelain jar with narrative scene from the Yuan zaju drama ‘The Savior Yuchi Gong.’ Sold for $1,324,000. I.M. Chait image. I.M. Chait’s director of operations, Josh Chait, described a tense battle that pitted the ultimate winner against an Internet and absentee bidder, as approximately 100 guests in the gallery looked on. “It was the same feeling as watching a high-stakes gambling event. There’s no way of knowing who will come out on top. Also, whenever there’s a phone or Internet bidder involved, you can never be sure what their limit is,” Chait said. Beyond the million-dollar threshold, bids on the precious Chinese artifact increased in $10,000 increments. When bidding ceased at $1.1 million, presiding auctioneer and company founder Isadore M. Chait called out, “Going once – going twice – sold!” and brought down the hammer to thunderous applause. In spectacular condition, the 14-inch blue and white ovoid jar is a revered historical icon from China’s Yuan Dynasty period. Its decorative motif narrates a scene from the Yuan zaju drama “The Savior Yuchi Gong” and describes how General Yuchi Gong saved the Tang Emperor Taizong from assassination. Isadore Chait had correctly predicted the vessel would reach or exceed one million dollars at auction. Several bronze, jade and furniture lots brought stellar prices, as well. Lot 224, a 7 7/8in spinach jade brushpot with a continuous landscape scene of sages in a courtyard, came to auction with provenance from the Cleveland Museum of Art Collection. Estimated at $35,000-$45,000, it rose to $122,000. Lot 186, a highly important early 15th-century Ming Dynasty gilt bronze Bodhisattva of Manjushri with six-character Yongle mark under its base finished well within estimate at $274,500. A Sino-Tibetan gilt bronze shrine with jeweled borders and eight elaborately chased repousse Buddhist emblems, entered as Lot 101, was bid to $36,600 against an estimate of $6,500-$8,000. The 295-lot auction’s closer, a pair of Chinese huanghuali wood armchairs, settled at $43,750, more than six times the high estimate. According to I.M. Chait’s records, most of the bidders taking part in the March 17 auction were either American or Chinese. Some had stopped over in Los Angeles specifically to attend the auction en route to Asia Week New York. Chait admits that he initially had concerns about the change of venue and feared that not being right in the thick of Asia Week New York might have a negative impact on his company’s March 17 sale. To contact I.M. Chait Gallery & Auctioneers, call 1-800-775-5020 or 310-285-0182; or e-mail joey@chait.com. Visit the company online at www.chait.com. BEVERLY HILLS, Calif. – The excitement of Asia Week New York, with its multitude of lectures, exhibitions and other special events, has attracted knowledgeable buyers from the Far East to Manhattan for the past seven years. Now dedicated Asian art aficionados who spend as long as 16 hours on an airplane to reach the US East Coast have a very tempting reason to add a Los Angeles layover to their itineraries. The I.M. Chait Gallery in Beverly Hills will be hosting a March 17 auction of Important Chinese Ceramics and Asian Works of Art to welcome those travelers to US shores. “Many outbound flights from Asia to New York make a stop in California along the way. Since we were unable to participate in Asia Week this year due to the unavailability of a suitable auction space in New York, we decided to conduct our annual Asia Week sale right here in our Beverly Hills gallery,” said Chait founder Isadore M. Chait. The I.M. Chait family and staff have left no stone unturned in preparing for the March 17 live auction, which also will be available to bidders via phone, Internet and absentee methods. The 295-lot sale is led by a premier Park Avenue (New York) collection of carved jades, early Chinese bronzes, ivories and fine ceramics. Also highlighting the event are Ming Dynasty porcelains (including 15th- and 16th-century examples) and carved jades from a second prestigious East Coast collection; and a collection of rare contemporary carved netsuke and Ojime pieces. A European collection was the source of the auction’s centerpiece – a magnificent 14th-century Yuan Dynasty blue and white ovoid porcelain jar (Lot 144) decorated with a continuous equestrian warrior scene. A most exceptional and historically significant piece, its motif narrates a scene from the Yuan zaju drama “The Savior Yuchi Gong” and describes how General Yuchi Gong saved the Tang Emperor Taizong from assassination. Isadore Chait believes the vessel could reach or exceed one million dollars at auction. Divine in more ways than one, a highly important early 15th-century Ming Dynasty gilt bronze Bodhisattva of Manjushri (Lot 186) wears an elaborately detailed crown, necklaces and earrings. A six-character Yongle mark is inscribed under the figure’s base. Estimate: $200,000-$300,000. From China’s 18th-century Qianlong Period, a celadon with gray-black jade mountain (Lot 212) is masterfully carved with the scene of two figures in a boat amid rockery and clouds. A third figure of a man is carved in relief to render the effect that he is crossing a bridge. This artwork is expected to make $45,000-$55,000. Another fine antique carved from celadon jade is the 18th-century Chinese marriage bowl on ornate hardwood stand (Lot 214). Of low, wide form with openwork bats and flowers on its handles, the bowl is decorated in relief with gourds and foliage that create the rebus “fulu shuangquan,” translated: “May both fortune and wealth prevail.” It is entered in the sale with a $40,000-$50,000 estimate. A third celadon jade artwork of particularly fine quality is the Chinese carved tablescreen (Lot 287) with an image of flowering bushes and rocks on its front and a lacquered landscape scene on verso. The carving is handsomely presented in a carved hardwood frame of archaistic motif with dyed green bone and ivory openwork borders. Estimate: $8,000-$12,000. Large and well modeled, an early Tang Dynasty model of a striding Bactrian camel (Lot 175), with mouth agape and separate bearded rider on saddle, stands 28 1/8 inches tall. It is accompanied by an Oxford TL Test Certificate and has a presale estimate of $25,000-$35,000. Extremely rare and dating to the Song Dynasty, a pair of pottery figures of seated generals (Lot 172), each wearing ornate armor and hats with removable finials, also comes with a TL Test Certificate (C-Link Research & Development Ltd). Estimate for the pair: $18,000-$24,000. An example of symmetrical perfection in Chinese porcelain, a 21¼-inch-tall gu-form dragon vase (Lot 147) dates to the 16th-century Ming Dynasty. 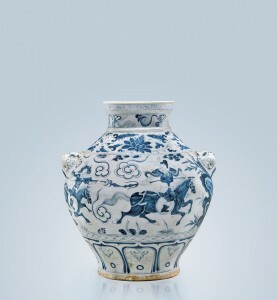 With a blue-on-white pattern that incorporates peonies, foliage and writhing dragons, the stately vessel bears the Wanli mark and carries an estimate of $35,000-$40,000. The realistic artistry on many of the netsukes in the auction simply must be seen to be believed. For example, a carved wood sashi netsuke (Lot 29) depicting a tall armored warrior deity about to plunge a long sword into an oni at his feet is as intricately detailed as any full-size work by a master sculptor. Each strand of hair on the oni’s head is clearly visible, as is the musculature of his legs. This particular netsuke is signed and boxed, and comes with provenance from the Florida estate of Michael Earlman. It is estimated at $2,500-$3,000. An impressive 7 7/8 inches tall, a spinach jade brushpot (Lot 224) is expertly carved with a continuous landscape scene of sages in a courtyard, with pavilions tucked amid rockery and pine trees. Formerly in the collection of the Cleveland Museum of Art and deaccessioned around 1950, the brushpot should realize $35,000-$45,000 at auction. Isadore Chait, who spent the past year carefully hand selecting each piece for his company’s March 17 auction, said he is confident the event will be a great success. “Asian art buyers have become one united community. Although it is always a pleasure to see and be seen in New York during Asia Week, we know that the location of our auction room is of far less importance, now, thanks to new technologies and the choice of bidding methods that have been made available to Asian art buyers,” he said. I.M. Chait’s Asia Week Important Chinese Ceramics & Asian Works of Art Auction will take place at the Chait gallery on Sunday, March 17, commencing at 1 p.m. Pacific Time. The gallery is located at 9330 Civic Center Dr., Beverly Hills, CA 90210. 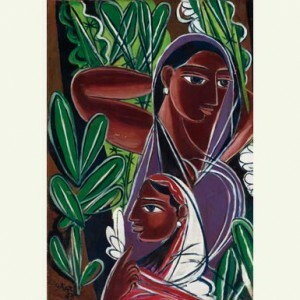 All forms of bidding will be available, including live via the Internet through LiveAuctioneers.com and Artfact.com.